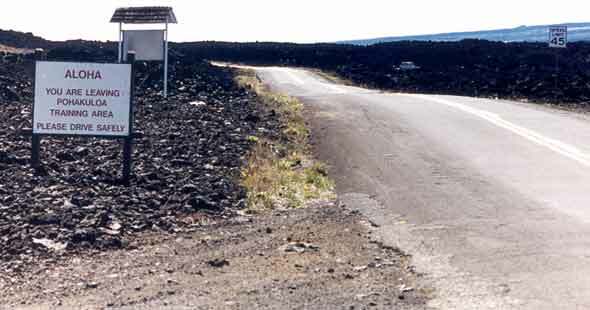 Here are about a dozen photos of what is now called Ala Mauna Saddle Road across Hawaii's Big Island, with links to other sites on this road through the Big Island's interior. 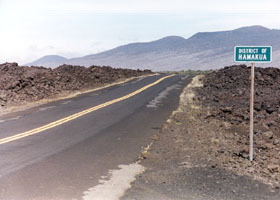 The high-altitude side roads to the Mauna Kea and Mauna Loa observatories, previously covered here, are now on a photos page of their own. Note: This page has not caught up to the ongoing major improvements made to Saddle Road in the last few years. 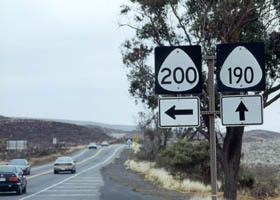 Some of the photos, particularly of now-bypassed portions of the highway through the Army's Pohakuloa Training Area, are now mainly of historical interest. 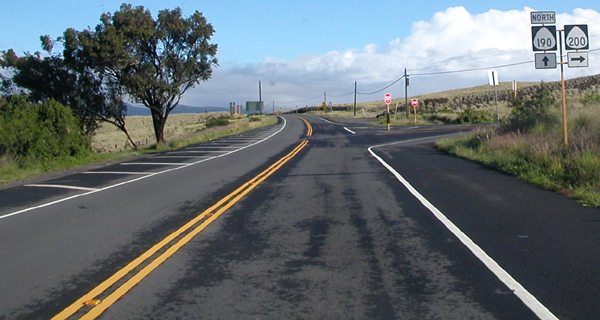 Ala Mauna Saddle Road (state/county route 200) is the closest thing to a cross-island highway on the Big Island. 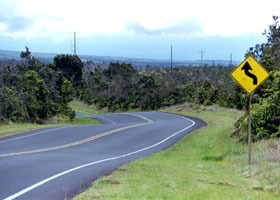 It is a famously bad and dangerous road despised by most rental car companies, which generally prohibit tourists from taking their vehicles on the road (Harper's, in Hilo and Kailua-Kona, is the most notable exception), making this highway perhaps the only paved state highway in the United States that is open to motor vehicles but off-limits to most rental cars. 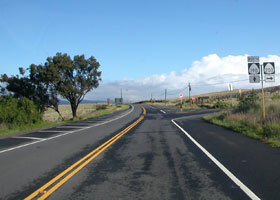 The road was built as a gravel road during World War II to provide access to an Army training area in the Big Island's interior, and also as an inland evacuation route if Japanese forces attacked the Big Island. The road was paved in 1949. At least the western ten miles feels like it hasn't been maintained or improved much since. 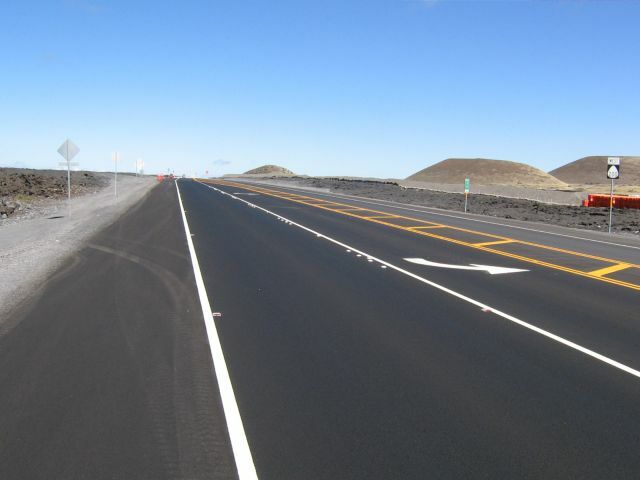 However, it is an interesting road for intrepid travelers, with its close-up views of the Mauna Kea and Mauna Loa volcanoes and the lava fields covering the "saddle" between the two. 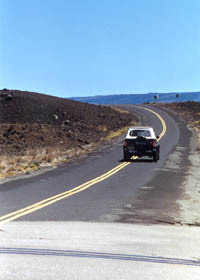 It also takes travelers to side roads to the observatory complex on the Mauna Kea summit, and a weather observatory high on the north slope of Mauna Loa (which also is one of the two trailheads for the arduous hike to the Mauna Loa summit). Those side roads are the subject of a separate photos page, which follows this one. 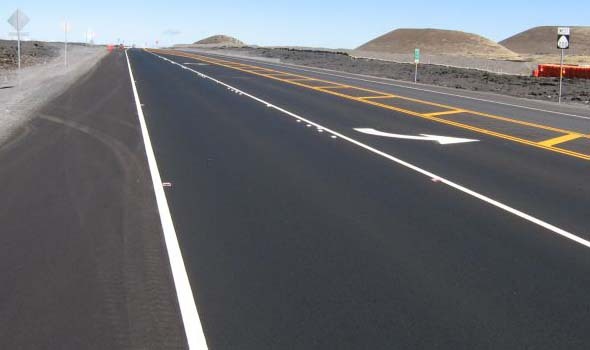 The state is realigning and improving Ala Mauna Saddle Road (and perhaps ultimately will extend it to join state route 19 on the Big Island's west coast), which should make the road less "exciting," and more rental-car friendly, without diminishing the experience of driving through the stark landscapes of the Big Island's interior. 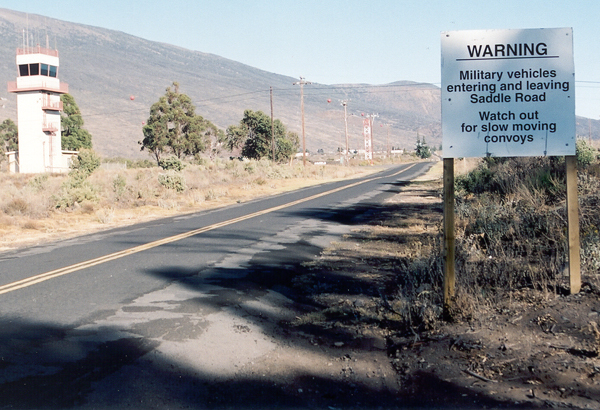 These plans picked up speed after 9/11, when the Defense Department offered to pick up the entire tab for the part of the project realigning the road away from the Army base, to improve base security and reduce conflicts between civilian and military traffic. Construction on that phase of the road improvements is underway. 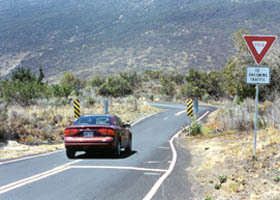 The first new segment (on a new alignment between mile 28 and mile 35) opened in late May 2007, at which time Saddle Road was renamed Ala Mauna Saddle Road ("Ala Mauna" means "trail to the mountains"). 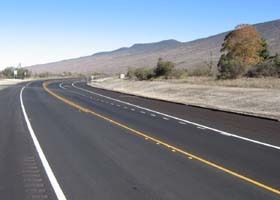 The next phase of the project reconstructed the existing road between mile 19 and mile 28, and was completed in 2008. 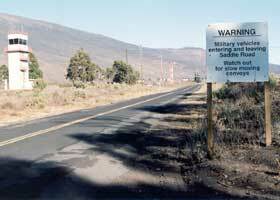 A later phase, between mile 35 and mile 42, reroute the rest of the highway passing through the Army base. 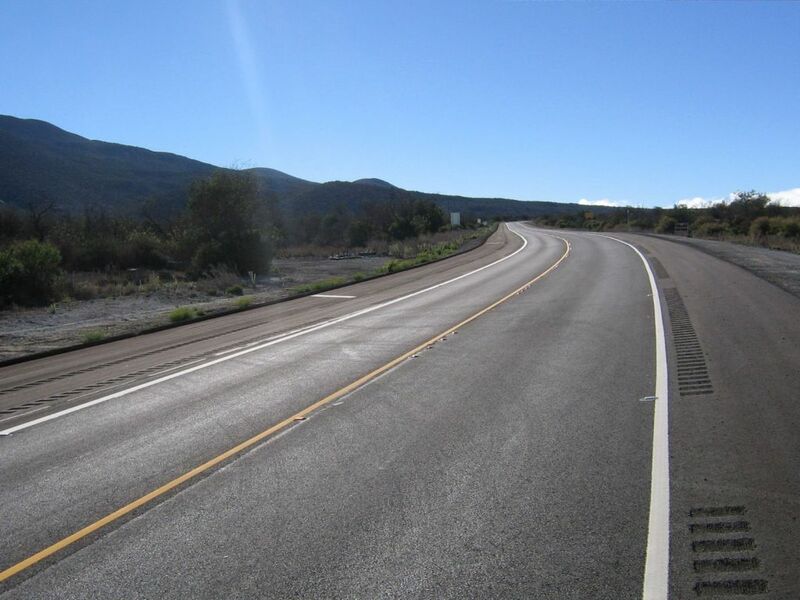 Improvements between mile 6 and mile 19, and realignment of the highway west of mile 42, are in the works, and all the Saddle Road improvements could be completed by 2013. 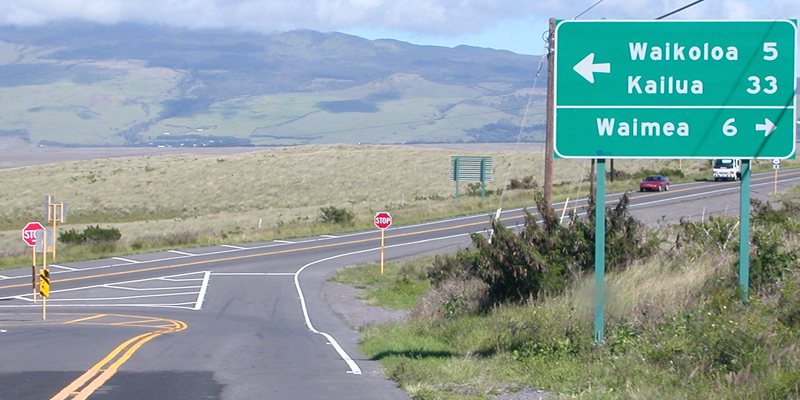 In addition, a recently-completed southern bypass of downtown Hilo makes it easier to get to and from Saddle Road's eastern end. This page has received only minor updates since 2007. 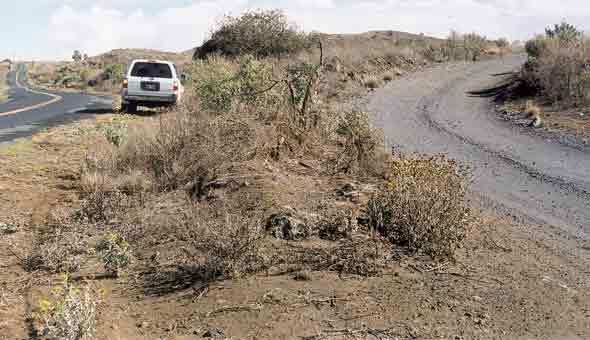 More material, including photos of new Saddle Road alignments, will be added later. NOTE: In case you want more detail, clicking some of the photos below (for now, just some from my 2001 trip, and 2005 and 2007 photos from other contributors) will call up enlarged, higher-quality (less .jpg compression) versions. Those alternate versions have larger file sizes, so please be patient while they download. Warnings: As shown in the photos below, some parts of Ala Mauna Saddle Road, including segments not yet bypassed, are very narrow with rough pavement edges, that make head-on collisions a real problem. Dense fog, as moist air rising upslope from the coast meets cold air rolling downslope from Mauna Kea and Mauna Loa, can make for dangerously low visibility. The road west of mile 41.5 is also not well reflectorized for night driving. 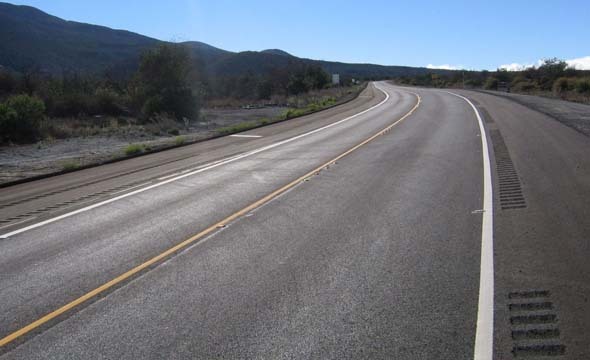 The road had an accident rate 80% higher than the Hawaii average for two-lane rural highways, though the recently-opened bypasses of some of the worst sections hopefully will lower that statistic. 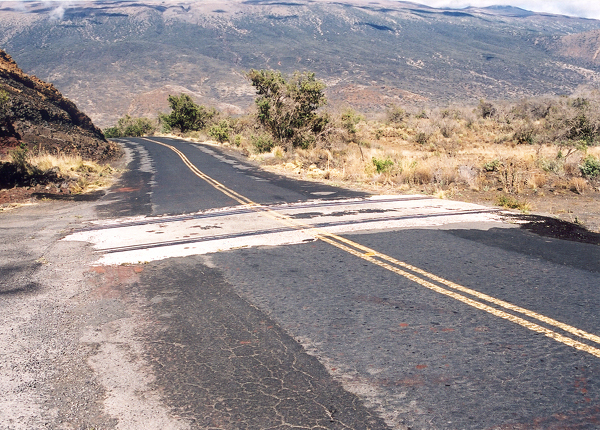 Most rental car companies prohibit taking their vehicles on this road (see above). Also, there are no travel services at all on Ala Mauna Saddle Road, so make sure to refuel in Hilo before heading west, or Waimea, Waikoloa, or Kailua-Kona before heading east (especially if you plan to take the side roads to the observatories on Mauna Kea and Mauna Loa -- the high altitude can increase your fuel consumption quite a bit). 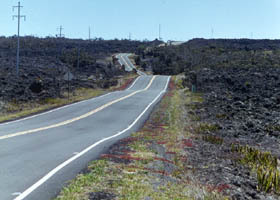 The Mauna Loa volcano south of Ala Mauna Saddle Road is active, though not currently erupting. 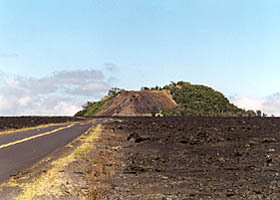 An eruption could close the road, though such closures are improbable (the most recent lava flows in the corridor were more than 70 years ago), and there will be plenty of advance notice in any case. The Mauna Loa volcano is closely watched by the Hawaii Volcano Observatory, whose web site will have current information on any signs of trouble from Mauna Loa. © 1999-2007, 2010 Oscar Voss.